This grouping gathers together all versions of the "Somewhere Between Heaven And Hell" album, originally released in 1992, as well as subsequent repressings and bootleg versions. "Somewhere Between Heaven And Hell" is the fourth studio album by the American punk rock band Social Distortion, released on February 11, 1992. It continues the melding of country and rockabilly influences with punk that began two albums before with "Prison Bound". Clear influences include Hank Williams (on "This Time Darlin'") and Johnny Cash (on "99 To Life"). The album also marks the first time that a Social Distortion line-up had not changed in three consecutive studio recordings. 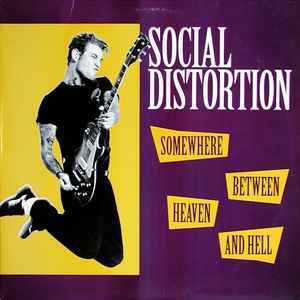 This was the last Social Distortion album with drummer Christopher Reece, who was replaced in 1993 by Randy Carr. Any opinions on the sound of this reissue? I'm curious if it's decent or if the transfer is complete crap. Thanks. barcode? more pics? is this one a Zonie release, too?